Are you tired of paying retail prices for printing? We offer wholesale pricing to the public on large or small orders. Quantity discounts are also available. No hidden fees, no organizations or clubs to join, it is free to view our prices and you will only pay the posted price, no gimmicks, no add on pricing, no surcharges when you reach the shopping cart. 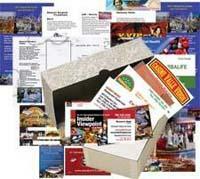 At this web site, if you can follow three easy steps you will save a lot of money on your print needs.